Your home for news on Bruce Chatwin and literary travel. 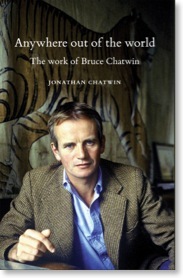 Anywhere Out of the World: The Work of Bruce Chatwin by Jonathan Chatwin. "Change is the only thing worth living for. Never sit your life out at a desk. Ulcers and heart condition follow." Taken from the Western Mail, October 19th 2007; review by David Adams. 'BRUCE CHATWIN’S marvellous novel, set just outside Abergavenny, has proved to be a minor classic. Andrew Grieve’s film of the book was vivid and much admired and Charles Way’s stage adaptation for the Made in Wales Stage Company, was one of that company’s finest hours. Now Way, a quarter-of-a-century on, has adapted it again for the ajtc Theatre Company and Guildford Yvonne Arnauld Theatre. How times have changed during that time is evident, not so much in the script but in the form – a play that had a cast of 12 is now a two-hander plus accompanying cellist. 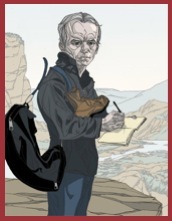 Way was in many ways the ideal writer to adapt On The Black Hill. Not only is his home in Abergavenny, but his plays take that same long view, seeing a world of change in the lives of a few. And Gwent Theatre’s small space in Abergavenny, the Melville Theatre, was the perfect place to catch the show on its UK tour. I think this pared-down version, where that broad sweep is seen through the eyes of the two twins, could have worked. It is their relationship, their honest, uncluttered views, their unambitious coping with the vagaries of life, that is at the heart. But Iain Armstrong and Mick Jasper, while clearly committed, just don’t capture the essence in any way, rarely escaping their very Englishness, their simple cloth clothes and bare feet hinting at a dated pseudo-classic poor theatre, their scampering style at odds with the tenor of the narrative. There is the inevitable accent problem – that border one isn’t easy to catch, but we are expected to accept here that two twins seem to come from two different parts of Wales. But it isn’t just that, or the sub-Dylan Thomas- esque comedy of some scenes, or the difficulty of the actors playing the joint narrators, the two central characters and their parents and neighbours, including mother, sister and girlfriend. It’s that the performance in general just doesn’t grab you, rarely moves you, and quite certainly doesn’t have the epic scope of the book or the original play. The short scenes and exaggerated playing of so many characters look like a cut-down comic-book version of a classic.